The Silva Method is the original Alpha/Theta Training which for over 50 years has been taught in more than 110 countries years and experienced by millions of people. It is a profound experience where you discover your power for self-healing, create solutions for personal power and self-improvement, enhance memory, learning and focus. You will also awaken and develop your intuitive wisdom to improve the quality of life for yourself and/or your loved ones and help to create a better world. The Silva Method Dynamic Meditation program will accelerate your life in ways that you will find truly awesome. What is Meditation? What is Dynamic Meditation? What is the Alpha Level? How to reach it and function there within 30 seconds! SILVA is a scientifically proven and systematic program designed to help people to function at the alpha level.Alpha brainwave activity is associated with inner levels of mental awareness, tranquility, rest and relaxation. It leads to inspiration, creativity, accelerated learning, healing, concentration and psychic abilities. After attending the foundation seminar, the SILVA Life System seminar students are able to access thealpha level within 30 seconds, because this is a hands-on training program (much like learning how to drive a car, rather than reading a book about driving). In this program, students are taught how to slow down their brainwave activity to the alpha level through controlled relaxation exercises and with conscious awareness. Why? Because it is at the alpha level that both left and right sides of the brain are synchronised and you now have the benefits of both hemispheres working for you (whole brain thinking) and hence, with this increased awareness, you can now program your goals. It is akin to the state of meditation however going one step further. The SILVA Seminars are mindful not mindless meditation training programs. Students, can now use the alpha level to program their goals like improving health, increasing memory retention and recall, achieving success in exams or business, improving relationships, finding solutions, problem solving and enhancing earning ability, and finally, getting in touch with their Higher Self for guidance and inspiration. In this program, students learn about the infinite potential of their mind, and in using it to bring about changes in their world, for their good and for the good of all concerned. Through controlled relaxation, the students learn to relax physically and mentally while at alpha, releasing stress enzymes, strengthening their immune system and releasing endorphins (the feel-good chemicals) into your system. Imagine expanding your mental abilities and enhance your spiritual nature and as a result attract health, wealth, and happiness into your life with ease? It has been said that Einstein used only 10% of his mind, and the general public uses 3% or 4%. And that's what the Silva Method is all about: learning to use more of your mind in a more effective manner. The Silva Method is the original mind development and empowerment program where you learn to actually use the untapped power of your mind to accomplish whatever you desire. 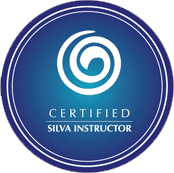 Upon successful completion of the seminars, you will earn a certificate from Silva International which entitles you to "FREE, Repeat for Life privileges" of the entire Silva Method anywhere in the world. A nominal seating-fee is charged by a Silva Instructor for repeating the Seminar. SILVA is the only one that offers this benefit!